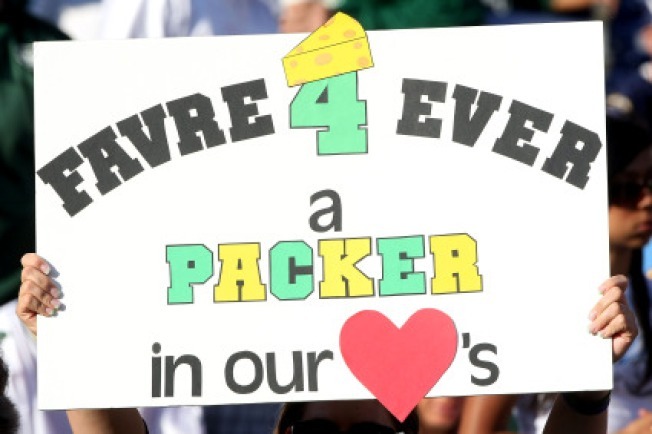 Brett Favre's return to Green Bay is hotly anticipated. It's all Brett, all the time. We're starting to get really sick of this. Despite numerous other viable storylines -- the Saints' brilliance; the Broncos' surprising success -- Brett Favre has managed to dominate the NFL consciousness in 2009. This is what he does. This is why he came back. Favre, for all the innocent tendencies sports casters love to ascribe to him, is at his very core addicted to attention. The minute it goes away, he takes it back with even greater force than before. Favre's 2009 return to the Minnesota Vikings has all been leading to this: A showdown at Lambeau Field with his former team, in front of the fans that worshipped him for so many years. How will those fans react? How will Favre play? Will things get emotional and teary-eyed, or will the vindictive Favre, the one that wanted to come back with the Vikings to prove to the Packers they made a mistake promoting Aaron Rodgers two years ago, show up? The football media, for its part, is playing along. Fox is going to utilize a Favre-cam throughout the contest -- we're not making this up -- that will give fans a constant view of Favre when he's on the field and off. The official word from Fox is that the camera will be "isolated on Favre from the second he takes the field against his former team until the moment he runs back into the locker room." Important football-related happenings may or may not be taking place on the field, but screw that! You can watch Favre model baseball caps! Fun! And it's not just the Favre-cam; you can bet this week's pre-game shows will be chock-full of Favre-Packers, and the result of the game will be discussed high and low for a week. Once Favre is done with this Packers game, he goes back to being just another football player, albeit one who fosters man-crushes in even the most butch of football analysts. Either way, the sooner this happens, the better.